The use of dogs in hospitals and other therapy institutions is on the rise, as more medical professionals acknowledge the positive effects of dogs on human patients. New expert guidance by the Society for Healthcare Epidemiology of America (SHEA) outlines recommendations for developing policies regarding the use of animals in healthcare facilities, including animal-assisted activities, service animals, research animals and personal pet visitation in acute care hospitals. The guidance was published online in Infection Control & Hospital Epidemiology, the journal of SHEA. Allow only dogs to serve in animal-assisted activities, such as pet therapy. Animal handlers must have all required immunizations, restrict contact of their animal to patient(s) visited and prevent the animal from having contact with invasive devices, and require that everyone who touches the animal to practice hand hygiene before and after contact. The policy allowing service animals of patients and visitors into the facility should be compliant with the Federal Americans for Disability Act (ADA), other applicable state and local regulations and include a statement that only dogs and miniature horses are recognized as Service Animals under federal law. If an inpatient has a service animal, notification should be made to the Infection Prevention and Control Team, followed by discussion with the patient to make sure the owner of the service animal complies with institutional policies. Exceptions can be considered if the healthcare team determines that visitation with a pet would be of benefit to the patient and can be performed with limited risk. Even then, visitation should be restricted to dogs. The authors of the guidance also note that as the role of animals in healthcare evolves, there is a need for stronger research to establish evidence-based guidelines to manage the risk to patients and healthcare providers. This guidance on animals in healthcare facilities has been endorsed by the Association for Professionals in Infection Control and Epidemiology (APIC), the leading professional association for infection preventionists with more than 15,000 members. “Dogs communicate primarily through body language, and one of our challenges was to develop sensors that tell us about their behavior by observing their posture remotely,” Roberts says. “So we can determine when they’re sitting, standing, running, etc., even when they’re out of sight – a harness-mounted computer the size of a deck of cards transmits those data wirelessly. 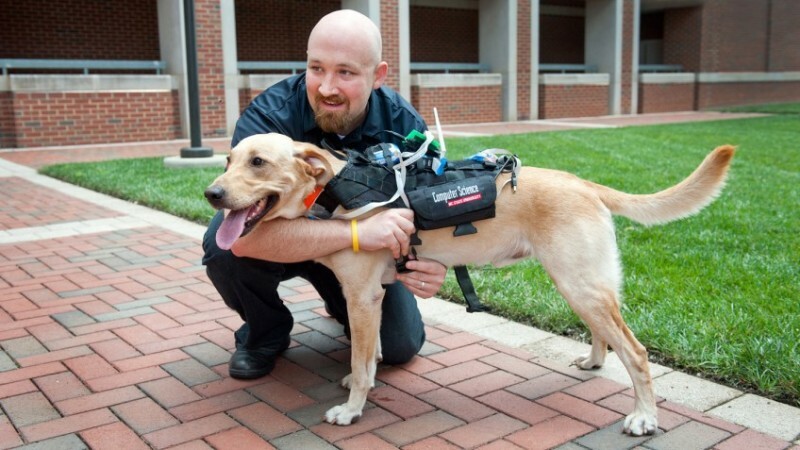 “At the same time, we’ve incorporated speakers and vibrating motors, called haptics, into the harness, which enable us to communicate with the dogs,” Roberts adds. “We developed software to collect, interpret and communicate those data, and to translate human requests into signals on the harness,” says Rita Brugarolas, an NC State Ph.D. student and co-author of the paper. The technology also includes physiological sensors that monitor things like heart rate and body temperature. The sensors not only track a dog’s physical well-being, but can offer information on a dog’s emotional state, such as whether it is excited or stressed. These technologies form the core of the technology platform which can be customized with additional devices for specific applications. “For example, for search and rescue, we’ve added environmental sensors that can detect hazards such as gas leaks, as well as a camera and microphone for collecting additional information,” Bozkurt says. Other applications include monitoring stress in working dogs, such as guide dogs and other service dogs. 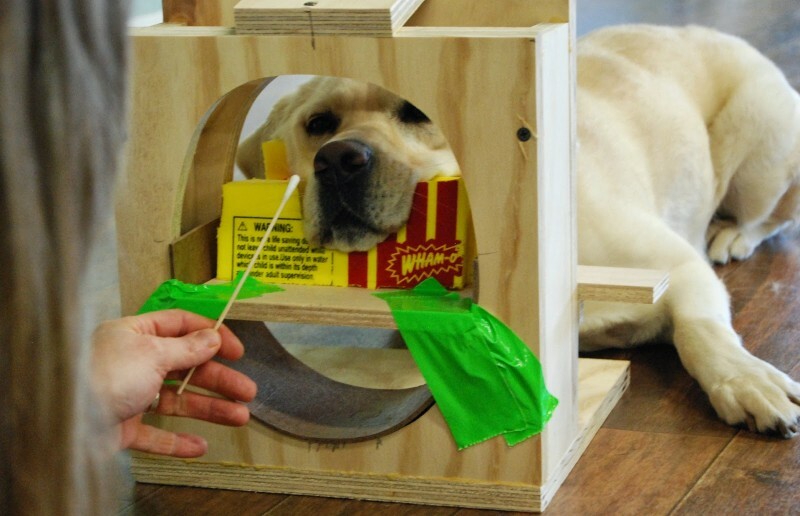 Physiological and behavioral sensors will provide insight into a dog’s mental and emotional state. “This platform is an amazing tool, and we’re excited about using it to improve the bond between dogs and their humans,” says Dr. Barbara Sherman, a clinical professor of animal behavior at the NC State College of Veterinary Medicine and co-author of the paper. There’s a worrying and growing trend in the United States. It’s Service Dog Fraud – when dog owners purchase fake service dog vests and then take their dogs into public places. Yet, the sale of fake service dog products is unregulated. On a recent flight through Los Angeles International Airport, the volunteers in their PUPs programme told me that they regularly see fake service dogs at the airport. They can be spotted a mile away – dogs that are clearly pets with behaviors that are not characteristic of true service dogs doing things like jumping on people or stealing food. Canine Companions for Independence is asking dog owners to take a pledge to stop service dog fraud. You can take this pledge by clicking here. I encourage you to sign the pledge and circulate it to your friends and relatives. If you know of someone who is illegally passing their dog off as a service dog, please ask them to stop and help them to understand what problems they are causing. 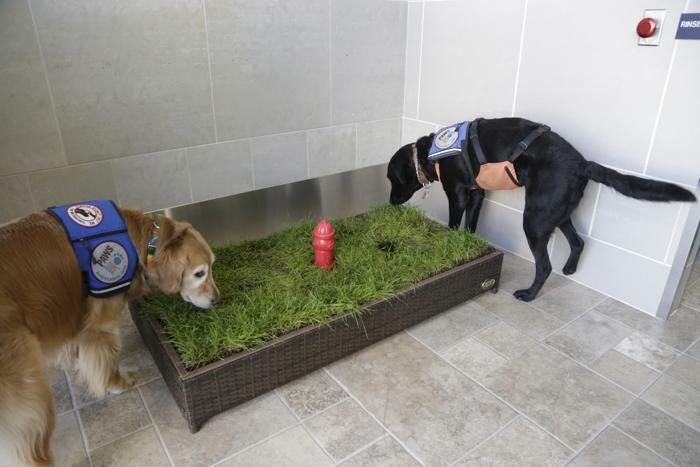 The Detroit Metropolitan Airport has just invested $75,000 for a dog loo primarily to support service dogs traveling with their owners. Most dogs in airports are certified service dogs but this facility will also help passengers who are flying with their dogs on holiday or to events like dog shows. Small dogs can fly in the cabin of most US airlines providing they meet size restrictions. Non-profit agency Canine Companions for Independence is circulating a petition to the U S Department of Justice to urge them to take action against fake service dog/assistance dog products. 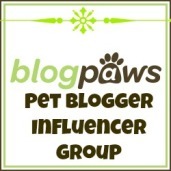 These products, mostly sold online, fraudulently portray a dog as an assistance dog. As service animals, they will be permitted inside grocery stores, restaurants and other public places where family pets are otherwise not allowed. As a result of these acts of fraud, people with disabilities who have a legitimate need for an assistance dog face added discrimination and are being denied access to public places, which is in violation of the Americans with Disabilities Act. As an example, check out last month’s publicity when Air New Zealand allowed access to two French bulldogs whose owners carried papers certifying them as psychiatric dogs. Air New Zealand obeyed the law but the scepticism of the journalists and public who commented on the article was clear. We simply can’t afford to have the public doubt the authenticity of assistance dog and service dog training programmes. If you agree with me, please support this cause and sign the Canine Companions petition here.